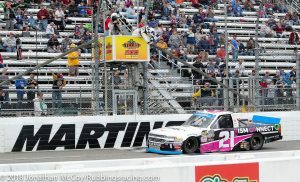 MARTINSVILLE, Va — Johnny Sauter won his sixth race of the year at Martinsville Speedway on Saturday. 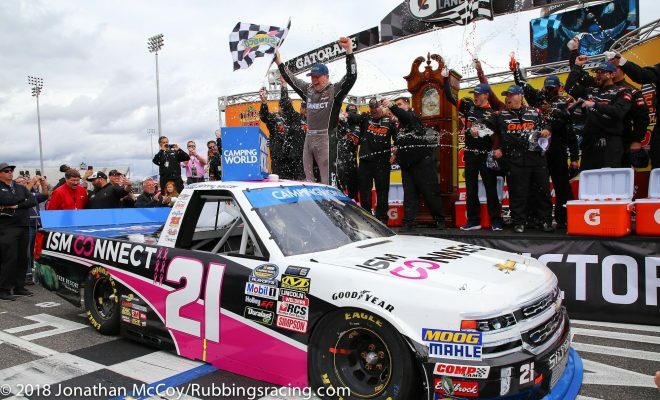 His victory punched his ticket to race for the championship in Homestead Miami in three weeks, it also made him the fifth winningest driver in NASCAR Camping World Truck Series history. On the first lap, the pole sitter, Todd Gilliland, lead the way. By the time the field circled back around to the start/finish line he had a half second lead over second place, Harrison Burton. After ten laps he was ahead by 1.3 seconds. Jennifer Jo Cobb and Brad Foy were both lapped 12 laps into the race. On lap 37 Chad Finley wiped out in turn-three. He spun his No. 33 Airlift/Strutsmasters.com Chevrolet and gave the outside wall a shunt. Drivers who aren’t running for a championship pitted under the first caution period. The race restarted on lap 43 with Sauter taking the helm. Noah Gragason emerged from the gaggle of playoff drivers in second, ahead of third place Matt Crafton. That trio finished the first stage of the race seven laps after the restart in the same positions they were in shortly after the restart. Sauter earned 10 championship points and an additional playoff point for his stage one finish. Under the stage break caution, the top-five drivers stayed out on track. All six playoff drivers began the second stage inside the t0p-10. A couple of laps after the restart Stewart Friesen spun in turn-one. The field was then re-racked and restarted on lap 67. On lap 89 Grant Enfinger over drove his truck into turn three. 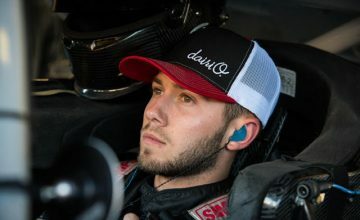 He knocked Crafton up the track and gave John Hunter Nemechek and Todd Gilliland an opportunity to get around them both. During this stint Sauter and Gragson ran away from the rest of the frontrunners. Gragson could drive up to Sauter’s rear bumper but couldn’t do anything with it. The stage concluded on lap 100, giving Sauter his fourth stage win of the season. Gragson earned 18 points in the first two stages and started the sixth in the final stage. Beginning the final stage, rookie Myatt Snider lead the field to the green flag. He battled with Sauter, dooring Sauter’s No. 21 ISM Connect Chevrolet in turn one on the restart. Shortly after the scuffle Sauter passed Snider for the lead. A lap later, rookie Kyle Benjamin banged on Sauter in turn three. He didn’t get position on the leader, but until the next caution flew Benjamin held his own in second. 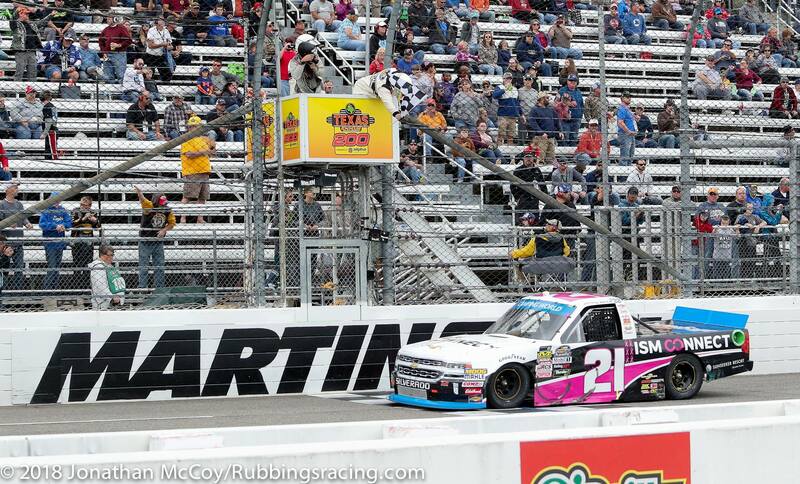 Johnny Sauter drives across the start/finish line, winning the Texas Roadhouse 200 at Martinsville Speedway. Photo by Jonathan McCoy. Gilliland, who lead the majority of the first stage, talked about how he’s “absolutely” bothered he hasn’t won yet this year. “I felt like we were going to be a little bit stronger than we have been so far. I really didn’t expect it to be such a hard transition, but I feel like we’ve been gaining on it every week since the beginning of the year and I feel like we’ve got competitive speed, top-five speed and now it’s just about getting that little bit extra. Patience was a virtue for the young racer Saturday. 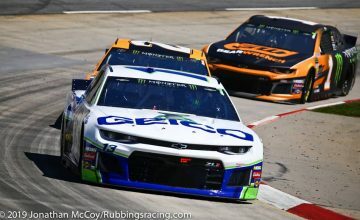 Mired back in traffic, Gilliland fought a tight condition for the nearly 50 lap stint to begin the third and final stage. Under a lap 152 caution for a spun Dawson Cram, Gilliland took his truck to pit road for adjustments. He had been in the midst of a fierce four car battle before the yellow flag flew. He restarted the race in 15th on lap 159. Sauter, who had more than a four second lead before the restart, lead the field back to the green flag, but Grant Enfinger was spun in turn one, leading to another caution period. In that first turn, Snider got position on Sauter, giving himself the lead. Sauter celebrates his sixth win of the year, and fourth at Martinsville Speedway. Photo by Jonathan McCoy. Snider commanded the restart on 169 from the left lane, but he had to block the inside when Brett Moffitt took a look below him. Sauter used Snider’s narrow entry to his advantage, passing him to retake the lead. In no time Sauter was more than a second ahead of the others. For more than 10 laps, Moffitt drove into the back of Snider. With 13 laps remaining in the race Moffitt made the pass. Running in second, he was 3.5 seconds behind the leader with 10 laps to go. 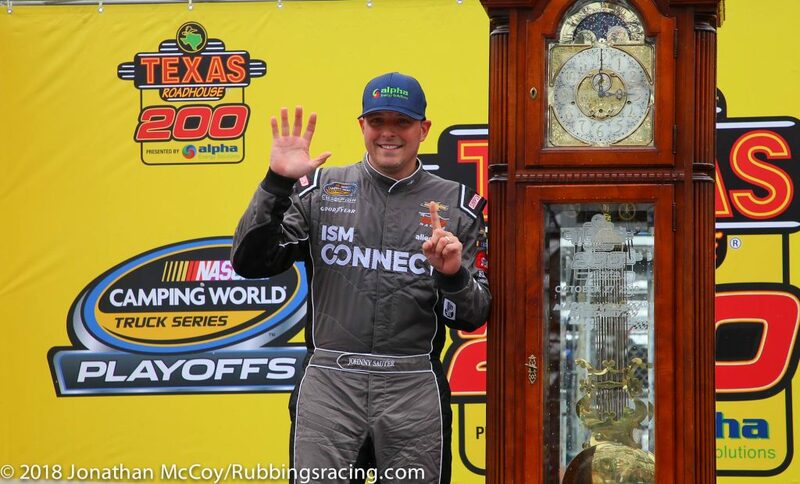 Ahead by 4.572 seconds, Sauter won his 23rd NCWTS race in dominating fashion. It was his fourth win and 12th top-10 at Martinsville Speedway. Snider wound up in third place, making him the highest finishing rookie and non-playoff driver. Finishing just behind him in fourth was Ben Rhodes. Benjamin, who’d briefly contended for the lead ended his day in fifth. In each of his only two starts in the NCWTS, both at Martinsville Speedway, Benjamin has earned a top-five. Six yellow flags were shown over the course of the 200 lap race, four of which were for on track incidents. Looking towards the chase for the championship, Sauter is now the only driver guaranteed a spot in the Championship four. Excluding Sauter from the points rundown, Gragson is now in command of the series points lead. He’s 22 points ahead of fourth place, and 24 out from fifth place, the first position to not advance to the championship race in three weeks. Behind him in the points standings is Brett Moffitt in third. He’s only 13 points away from Enfinger, who’s in fourth. He’s 15 away from Justin Haley, who’s currently fifth in the standings. Series champion, Matt Crafton 32 points away from Gragson and is in sixth place following Saturday’s race. He’s 10 points back from the final transfer position for the championship. Next weekend the NCWTS will roll into Texas Motor Speedway for the second race in the round of six. The following weekend the round will conclude with the series’ race at ISM Raceway in Phoenix, Arizona. Next Story → MENCS: Kyle Busch wins the pole for the First Data 500, Bowyer to start alongside.